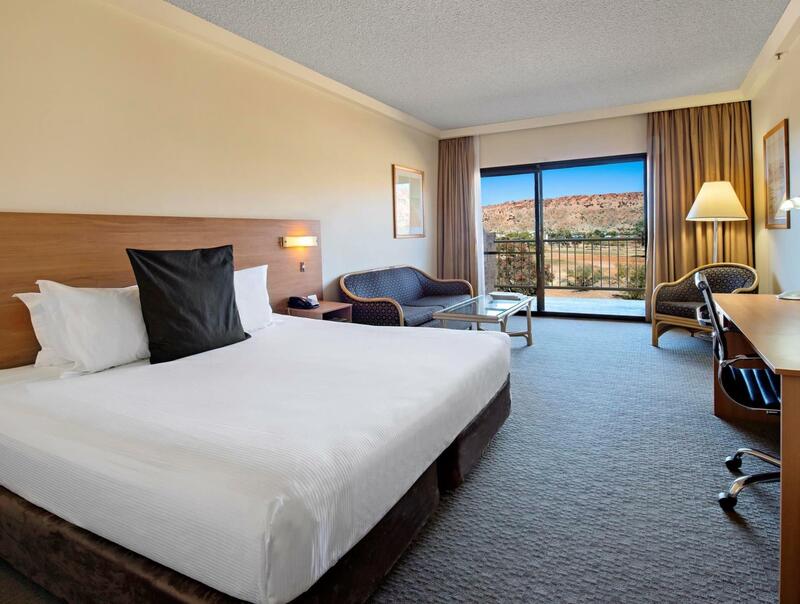 يوفر فندق DoubleTree by Hilton Alice Springs ظروف إقامة راقية وهو خيار رائج للسياح ولرجال الأعمال أيضاً. يقع في منطقة ثقافة, كازينوهات, سياحة من أليس سبرينجس. يمكن من هنا للضيوف الاستمتاع بسهولة الوصول إلى كل ما تقدمه هذه المدينة النابضة بالحياة. سوف يعشق النزلاء موقع هذا الفندق، فهو قريب من أهم المعالم السياحية في المدينة كمثل لازيترز, مستشفى اليس سبرنجس, اولف بينك . 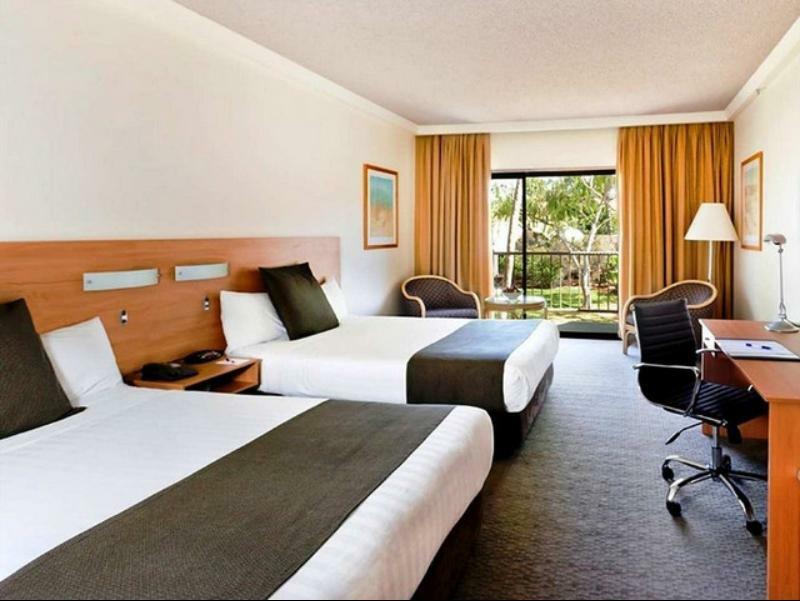 إن الخدمات الممتازة وحسن الضيافة العالي في DoubleTree by Hilton Alice Springs تجعل إقامتك تجربة لا تنسى. يمكن الاستمتاع بمجموعة من الخدمات على أعلى المستويات في الفندق كمثل خدمة الغرف على مدار الساعة, مكتب الاستقبال على مدار الساعة, مرافق مخصصة لذوي الاحتياجات الخاصة, تسجيل وصول/خروج سريع, واي فاي في المناطق العامة. بالإضافة لهذا,تتضمن كل غرف الضيوف مجموعة واسعة من وسائل الراحة . بعض الغرف توفر حتى تلفزيون بشاشة مسطحة, اتصال لاسلكي بالإنترنت, غرف لغير المدخنين, مكيف هواء, تدفئة لإرضاء أكثر الضيوف تطلباً. يمكنك طلب اللائحة الكاملة للخدمات في الفندق ومن بينها حوض استحمام ساخن, مركز للياقة البدنية, ساونا, مسار جولف - ضمن 3 كم, حمام سباحة خارجي. 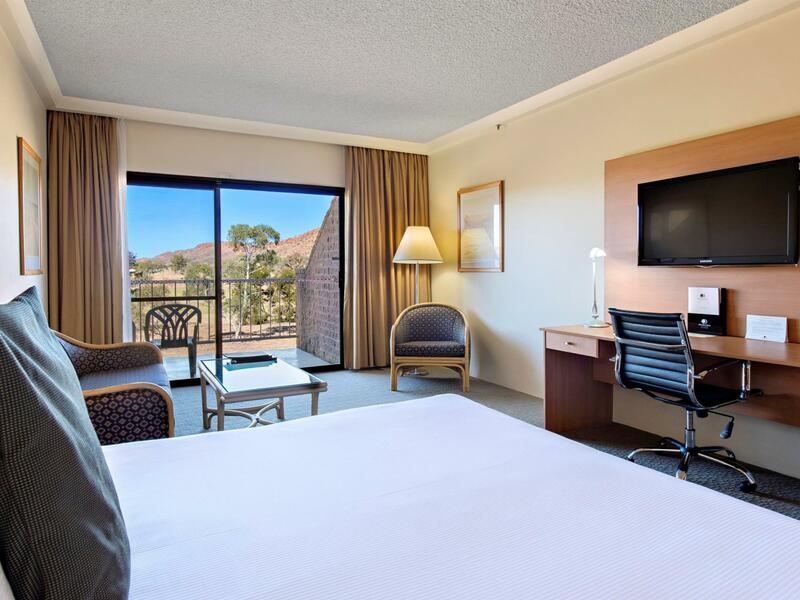 إن DoubleTree by Hilton Alice Springs هو خيارك لخدمة الفنادق الراقية في أليس سبرينجس. When we checked in, I provided the staff with our Hilton Honors Card and asked if they could get us into our room early as we had arrived early. Staff said that the room was not available but they could give us an upgrade and we could soon be in a room. Upgrade included a view and breakfast. View wasn’t important as we had a 19 hr tour the next day but breakfast sounded good. When we checked out, there was a charge for the view and breakfast. We talked with the manager and he said they never “give” breakfast. Unfortunately for us Americans, give means free. Apparently give to the Hilton meant it could be provided at a cost. I thought our Hilton Honors gave us the perk. Silly me. We came with AAT Kings day tour with a number of tour members waited for check in at the same time, yet only 1 staff was available at the beginning, when all of us were tired after early morning hiking and 6 hours on the coach. The room was excellent, nice and cozy . The Thai restaurant was worth to try though quite crowed and might need to wait for a while. Food quality was excellent but not all the staff was polite, depends on your luck. Overall, still recommend to those who plan to stay in Alice Springs. Checking in was absolutely a pleasure, quick and pleasant. The staff were lovely. The buffet breakfast was plentiful. Bed was comfy, the room was clean. Knowing all this whilst stumbling back into my room after a great night out for New Years was comforting. We stayed overnight. We liked the spacious room and our view of the mountain. The staff was very nice. It was kind of expensive but I think that all hotels in alice spring are within the same range. The breakfast menu could have been improved with more variety. Arrival early in the day didn't cause a problem and rooms were large, quiet, well-equipped and well-maintained, with the promised mountain view. Air-conditioning was efficient quiet and very controllable. Bathroom fixtures were modern and well designed. Hotel adjoins the golf course and is not in town. Generally a car is advised. In-room information was exasperatingly inaccurate: different numbers for contacting room service were given on the in-room menu and on the notice on the phone; there was no drinks menu in the room. Breakfast buffet was a bit limited but hot breakfast was good quality; breakfast staff appeared overstretched. Main meals could be taken in the bar-bistro style area (late morning onwards) or in the award-winning restaurant known for its food (open for lunch on weekdays only, but dinner 7 days). I used room service due to illness and it was very slow. The food was unappetising (very shrunken and wrinkled roast veggies) and almost cold; no salt or pepper were provided, although there was a butter portion despite no bread being requested (or provided). The hotel is not cheap, but the situation and overall hotel quality, plus the good restaurant, make it a place I'd want to stay in again. Stayed one night over the Australia Day long weekend. The hotel is getting on a bit so the facilities and rooms are a bit dated, although they were doing renovations in the foyer. The pool is great, clean and a good size even with quite a few quests using it. 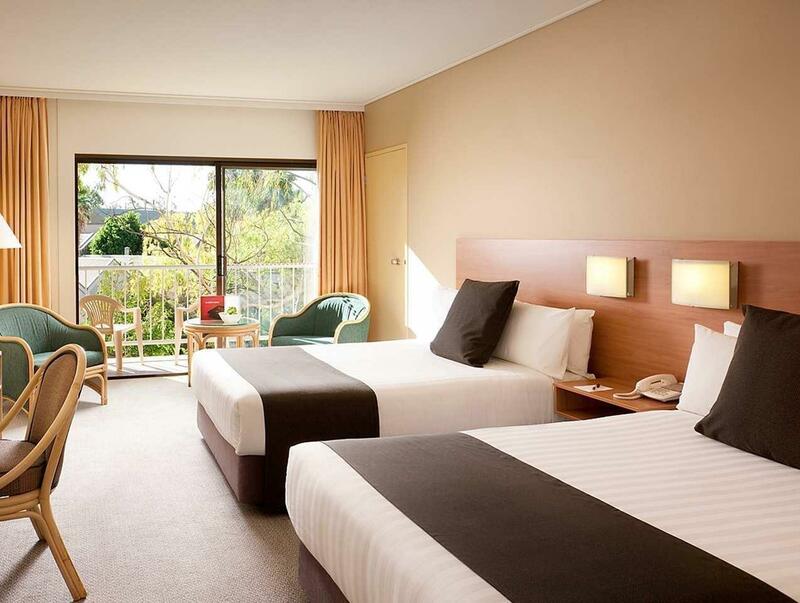 As far as Alice Springs accommodation options go, Doubletree is probably still one of the top two places to stay. Overall it’s a very nice stay provided that such a good bargain with this brand. The only downfall is the transportation!!! Hotel doesn’t provide any shuttle between airport or town centre. There is nothing around the area but only a casino. WalkIng distance to town but still take around 20-30 mins during a hot weather! 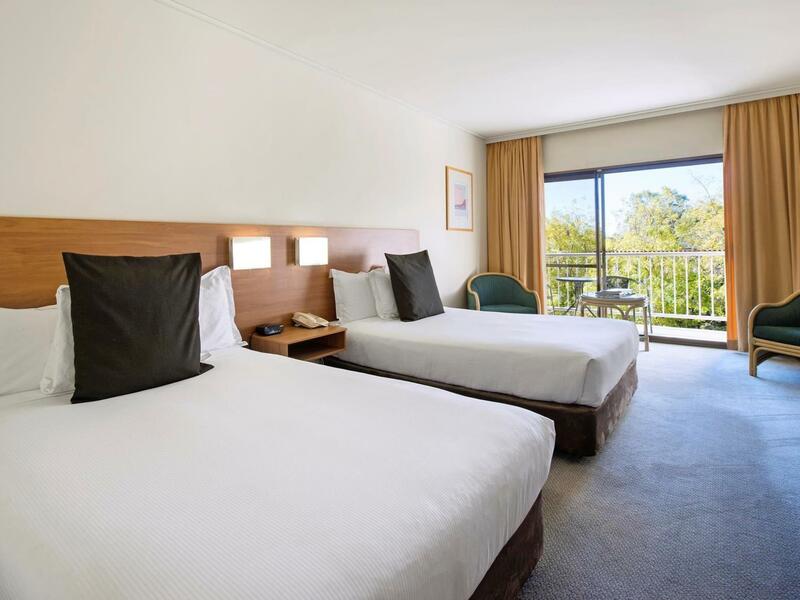 Always a delight staying at the Doubletree - one feels a bit more connected to the beautiful centre with the vistas of the range (if you have a room facing them). It is an excellent hotel particularly if you can get an Agoda special because otherwise the cost can be over the top - and in my view would not be good value for money if the costs were higher than the Agoda prices. We booked online, admittedly only 15 minutes or so prior to our arrival and on checkin were told the room we had selected was not available. We were offered another option with different sleeping arrangements but declined. Miraculously our original choice became available! Service at the Deck restaurant was mediocre. First we were asked if we minded waiting 2 minutes for a table to be cleared. No problem there but 1/2 an hour later we still hadn't been seated. We asked and were shown to our table then had to wait way too long for our order to be taken. The food, when it arrived was ok but nothing to rave about. Our room was clean, comfortable and very quiet which we enjoyed. We will stay again to give them another chance but not for a while. We booked the hotel last minute and the staff were friendly to accommodate us. 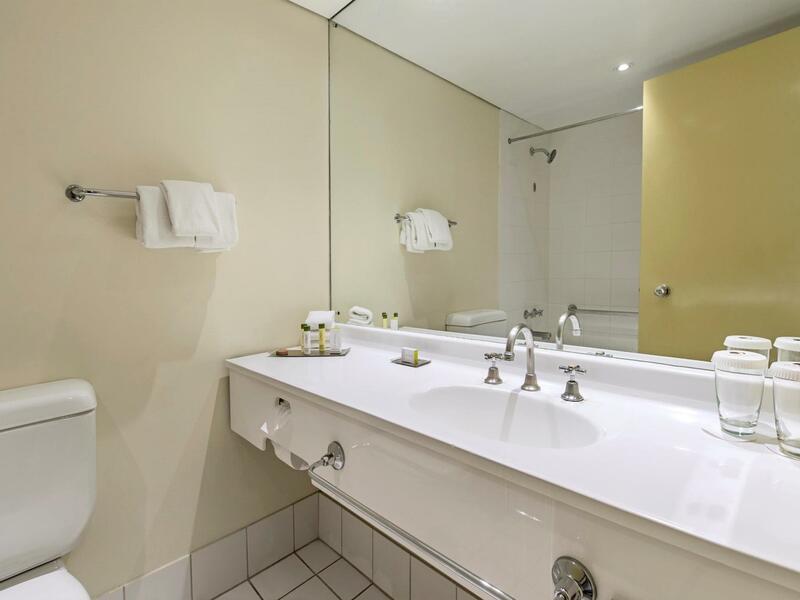 Although the decor of the rooms were slightly dated, they were clean and the beds comfortable. We had a good night's rest! The "Hilton" brand implies a certain minimum level of standards that is understood the world over. 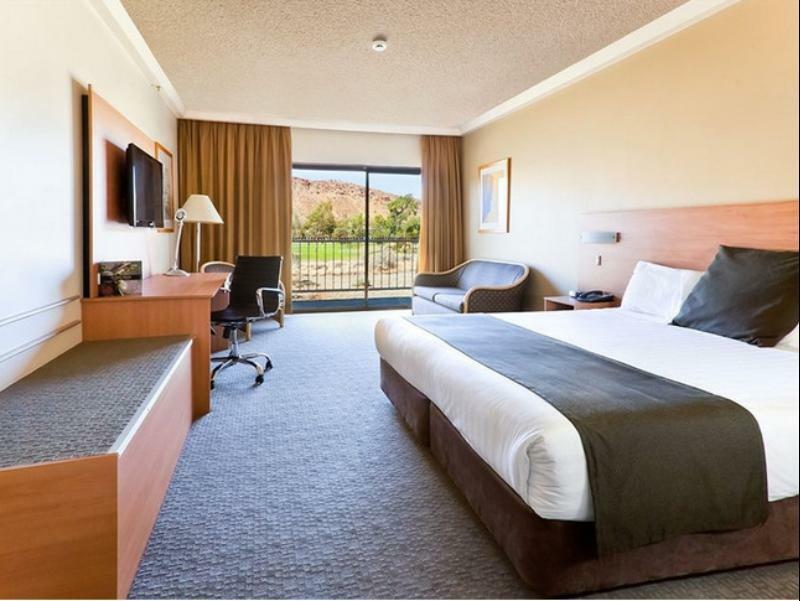 DoubleTree by Hilton Alice Springs was a somewhat unsatisfactory experience. I booked a suite. You would think a suite in a Hilton branded property would be pretty fantastic. The suite was comprised of a living area and a bedroom. When I awoke, I discovered that the door handle was faulty and the bedroom door could not be opened from inside the bedroom. This meant I was imprisoned. I picked up the phone beside the bed to call reception to have someone rescue me. The phone did not work. Thankfully, I had my mobile phone with me and I was able to telephone reception. After a period of twiddling my thumbs (with only a few hours remaining to hopefully get breakfast and make my late AM flight) a maintenance man burst into the bedroom without the courtesy of knocking (although most of my clothing was in the other room which I could not access, at least I had a pair of jeans to wear at this point in time). Really loved The Double Tree, it was beautiful and peaceful, the pool was fantastic, the mountain views and the size of our room were also great. The peacock which cruises around the whole time was also pretty nice along with the golf course just at your door step. Short stroll down to the casino and restaurant. we saw the beautiful peacock, we were so happy to see him by the pool side opening its tail. we love the thai restaurant so much, great food. location was not very convenient, but we just stay here for one night after we went to Uluru, then we went straight to airport flying back to Melbourne, which we found location is not an issue for us. We enjoyed to stay in the the hotel,however, there a few things that needed to be addressed. There is jacuzzi that was not clean and water there was not warm at all. We had an issue with an airport shuttle arrangement . Nov. 8,as we check in, we contacted the desk lady, young female(do not remember her name) to make arrangement for the next day shuttle transfer to airport. She looked up our schedule and told us to be in the lobby next day,Nov 9 at 15.50 afternoon. Next day we were waited for about 15 minutes past scheduled time and decided to ask the lady desk(asian female) about our shuttle. She looked up at her computer and said that there is nothing was scheduled for us. We had to rush and call a taxi cab ( who was way more expensive) in an order to be on our flight in time. I wish it wouldnt happen again to someone else. Other than that we had a great time to stay in your hotel again. غرفة بسرير بالحجم الملكي مطلة على الحديقة.